Peter is the big rugged fisherman who became the humble servant of the servants of God. Jesus chose him from among the Twelve to be the leader and the visible head of the Church. What do we know about Peter from the New Testament? More than most people realize. It is good to remember this man that Jesus specially chose. Here is my article on Peter and the Primacy in the New Testament. From the obscure fishing village of Capernaum on the shores of Galilee, Simon son of John rose to great prominence in the early Church. When choosing Simon as a disciple, Jesus informed him that his name would be changed to Cephas (Rock) (Jn 1:42). From his simple beginning as a fisherman, Simon Peter’s life ended in a glorious martyrdom in the Imperial City of Rome. In the NT, the names Simon, Peter, or Cephas occur almost 200 times. The names of all the other disciples combined occur only about 130 times. In the NT lists of apostles, Peter is listed first. Matthew uses the word first (Mt 10:2) to “to single him out as the most prominent one of the twelve”. He was the spokesman and authoritative voice of the apostles, as seen in the early chapters of Acts. Paul spent fifteen days in private with Peter before beginning his own apostolate (Gal 1:18). Jesus bestowed special prerogatives on Peter, recounted in Matthew 16:13-20. Peter is given a new name, which in Scripture denotes a change in status or position (e.g., Gen 17:4?5). Jesus spoke Aramaic and gave Simon the Aramaic name Kepha (Rock) which is is “Petra” in Greek and “Peter” in English. The Greek “petra” is feminine so the masculine “Petros” was adopted. There is no distinction between Kepha the man and Kepha the Rock upon which Jesus would build his Church-Peter is the rock (cf. CCC no. 552). Protestants often claim that Christ is the only foundation (1 Cor 3:11) attempting thereby to unseat Peter. However, they mistakenly mix the metaphors. In 1 Corinthians, Paul is the builder and Jesus is the foundation; in Matthew, Jesus is the builder and Peter is the rock foundation. Another NT metaphor pictures the Church “built upon the foundation of the apostles and prophets, Christ Jesus himself being the cornerstone” (Eph 2:20). Jesus chose Caesarea Philippi as the backdrop for the Petrine appointment. Here Herod had built a temple to Caesar Augustus atop the massive rock, a center of pagan worship and a source of the Jordan River. At the rock base was a gaping cavern referred to by the pagans as the “gates of hell”. Standing before the “temple” built to the “divine Caesar”, Jesus revealed God’s plan to build his new “temple”, the Church, to the true God with Peter as the solid rock. 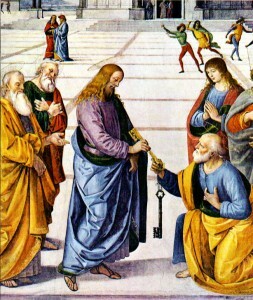 After establishing Peter as the “Rock”, Jesus promises to give Peter the “keys of the kingdom of heaven”-a reference to the steward’s keys in Isaiah 22. The Davidic throne had been vacant since the Babylonian captivity (586 BC). The archangel Gabriel announced to Mary her Son Jesus would be given “the throne of his father David” (Lk 1:42). As Jesus, the new King of Israel, re-established the Davidic throne he appointed Peter to the office of royal steward-to rule “over the house” of the king (cf. CCC 553). Keys represent exclusive dominion and this authority was granted to Peter alone. The office of royal steward was successive in Israel. Familiar with their history, the Jews certainly understand that the office of Peter would be filled by successors as was the royal steward’s office in Judah. The steward may die, but the office continues. 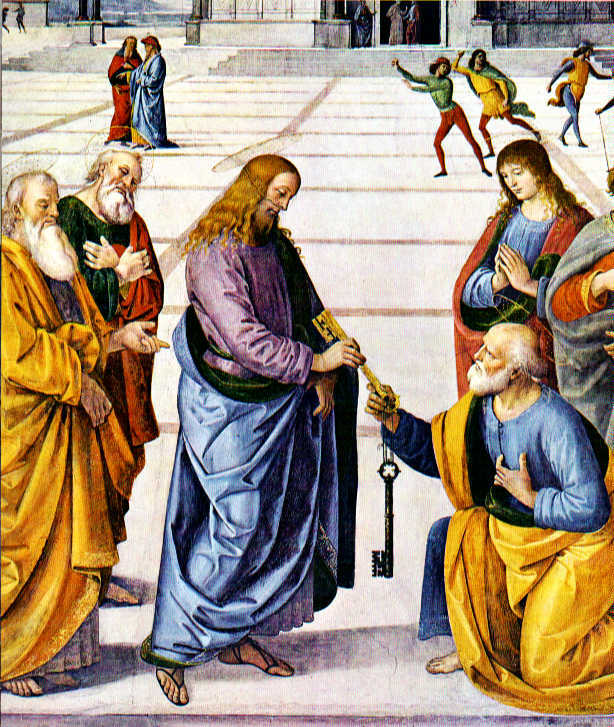 As the steward of Christ’s kingdom, Peter is given the authority to bind and loose. This entails more than “opening heaven’s door to those who believe the Gospel”. Protestant scholar M. Vincent explains, “No other terms were in more constant use in Rabbinic canon-law than those of binding and loosing. They represented the legislative and judicial powers of the Rabbinic office. These powers Christ now transferred . . . in their reality, to his apostles; the first, here to Peter.” Aramaic scholar George Lamsa writes, “ ‘He has the key,’ means he can declare certain things to be lawful and others unlawful; that is to bind or to loose, or to prohibit or to permit, or to forgive”. Other passages express Peter’s primacy. Jesus tells Peter that, “Satan demanded to have you [plural], that he might sift you [plural] like wheat, but I have prayed for you [singular] that your faith may not fail; and when you [singular] have turned again, strengthen your brethren” (Lk 22:31?32). Peter represents the apostles before God, and Jesus prays for him exclusively that he in turn can support his fellow apostles. This perfectly exemplifies the primacy of the Pope and his collegiality with the other bishops. Jesus also appoints Peter the shepherd of his sheep with the universal Church in view (Jn 21:15?17). The Jews would understand, according to contemporary usage, that the words “feed” and “tend” meant to teach, govern, and rule. St. Augustine comments, “The succession of priests keeps me [in the Catholic Church], beginning from the very seat of the Apostle Peter, to whom the Lord, after His resurrection, gave it in charge to feed His sheep, down to the present episcopate.” St. John, writing long after Peter’s death, reminds Christians of Peter’s singular status. Papal infallibility is often challenged by mentioning Paul’s public rebuke of Peter in Galatians 2:11-14. However, Paul does not oppose Peter’s teaching, but rather Peter’s failure to live consistently with his teaching. It was Peter’s example that everyone followed so his conduct was crucial. Papal infallibility does not guarantee impeccable conduct; it only guarantees infallible teaching under strict conditions (CCC no. 891). Paul acknowledges Peter’s office as “Rock” by referring to his as “Cephas” eight times-the title Christ himself had chosen. Tertullian (c. 160?c. 225) wrote, “If Peter was reproached [by Paul] . . . the fault certainly was one of procedure and not of doctrine” (On Prescription Against the Heretics, 23). James’ pastoral summary at the Jerusalem Council (Acts 15) does not nullify Peter’s primacy. On the contrary, Peter delivered a binding pronouncement and defined doctrine. Only after Peter spoke did the debating assembly “keep silence” (Acts 15:12). After Paul relates his experiences, James spoke, as the bishop of Jerusalem, to summarize, quoting Peter along with Scripture. In 1 Peter 5:1, Peter’s calls himself a “fellow elder”. This humble greeting does not diminish Peter’s authoritative office anymore than the President’s words “My fellow Americans” denies Presidential authority, or the Popes’ greeting “my fellow bishops” denies Papal authority. In the first century, Christians and Jews referred to Rome with the pseudonym “Babylon”-persecutor of God’s people. Peter wrote his first epistle from “Babylon” (1 Pet 5:13) where he was later martyred. Jesus prophesied that aged Peter’s arms would be stretched out and John interprets Jesus’ words as foretelling Peter’s death (Jn 21:18?19). After decades of spreading the Gospel and ruling as Bishop of Rome, Peter’s noble apostolate ended in crucifixion, though his Petrine office continued. Early Church history consistently affirms Peter’s crucifixion and burial in Rome around AD 67. From the first century onward, the chair of Peter in Rome was revered among the Church Fathers. Greek definition of the word “first”: Greek-English Lexicon of the New Testament and other Early Christian Literature (William F. Arndt and F. Wilbur Gingrich [Chicago, IL: Univ. Chicago, 1957], 733). Tertullian’s quote: William Jurgens, The Faith of the Early Fathers, Liturgical Press, 1:121. Vincent’s quote: M. Vincent, Word Studies in the New Testament, (Grand Rapids, MI: Eerdmans, 1887, 1980), 1:96. Augustine’s Quote: Against the Epistle of Manich¾us in The Nicene and Post-Nicene Fathers, first series, ed. by Philip Schaff [Grand Rapids, MI: Eerdmans, 1983], 4:130). Tertullian’s Quote: William Jurgens, The Faith of the Early Fathers 1:121. Referencing Rome as Babylon: (Orac. Sybil. 5, 159 f.; 4 Esdras. 3:1; Apoc. Baruch, vis. ii; Rev. 14:8; 16:19; 17:5; 18:2, 10, 21). Upon this Rock: St. Peter and the Primacy of Rome in the Scriptures and the Early Church, Steve Ray, Ignatius Press, 1999. Peter in the New Testament, Raymond Brown, ed., Augsburg Publ. and Paulist Press, 1973. And on this Rock: The Witness of One Land and Two Covenants, Stanley L. Jaki, Christendom Press, 1997. The Keys of the Kingdom Stanley Jaki, Franciscan Herald Press, 1986. Peter: Disciple, Apostle, Martyr, Oscar Cullmann, Westminster Press, 1953. The Shepherd and the Rock: Origins, Development, and Mission of the Papacy, J. Michael Miller, Our Sunday Visitor, 1995. Jesus, Peter, and the Keys, Scott Butler, Norman Dahlgren, David Hess, Queenship Publ., 1996. To see the whole life of Peter filmed on location in a rollicking and adventurous format, check out our DVD Peter, Keeper of the Keys. To hear Steve’s talk, Peter: the Rock, the Keys & the Chair, click here and scroll down a page. Infallibility: Must One be Sinless to be Infallible? Great apologetic. It frustrates me so much when other people discredit the Church Fathers or are entirely ignorant of them. God Bless your ministry. Looking forward to the Abraham series. At the Council of Jerusalem in Acts 15, the letter to the Gentiles from the council was sent by the “The apostles and elders and brethren” (Acts 15:23), and said that “it seemed good to the Holy Ghost and to us” (Acts 15:28). The brethren were included in the proceedings. James was the one who spoke to the group of apostles, elders, and brethren, and suggested sending the letter to the Gentiles by the hands of Paul, Barnabas and others. Vatican II’s Lumen Gentium 12 says: “The entire body of the faithful, anointed as they are by the Holy One,(111) [cf. 1 Jn 2:20, 27] cannot err in matters of belief. They manifest this special property by means of the whole peoples’ supernatural discernment in matters of faith when “from the Bishops down to the last of the lay faithful” (8*) [Cf. 1 Cor. 10: 17] they show universal agreement in matters of faith and morals. That discernment in matters of faith is aroused and sustained by the Spirit of truth.” This is in line with the Council of Jerusalem. Very well written. This is one area that is most frustrating to members of other denominations. If they accept the primacy of Peter, then their own church is in error. On the other hand, there is no scriptural support for multiple churches, each with their own head. This makes it almost impossible to carry out any sort of meaningful ecumenical dialog even when speaking in as charitable terms as possible within the limits of theology.